Day 4 of my #beercation to #AvlBeerWeek @BeerCityFest ! So yesterday started out as the previous. I made my own coffee I brought and ate in the hotel’s dining area. I lounged around afterwards and wrestled with getting the website updated. I was able to clean myself up and head down to an ESB brewing workshop at Fifth Season Garden Supply. 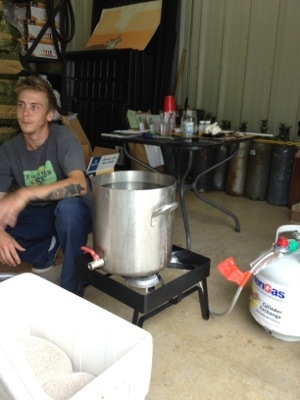 I already know how to brew an ESB, but I didn’t have anything else planned and figured it would be good to hang out with people interested in homebrewing. The garden shop also doubles as a homebrew supply store and is right behind Green Man’s brewery. Honestly, that was my main reason for going, because the workshop promised a tour of Green Man afterwards. Since I love Green Man’s ESB, I figured maybe the workshop was using their recipe and I would get to know how to replicate it. Well, they did a more basic recipe, but I did get to meet and hang out with some pretty cool people, a few who are already extract brewers. The workshop was very basic. When it ended, we did go to Green Man for a quick tour. 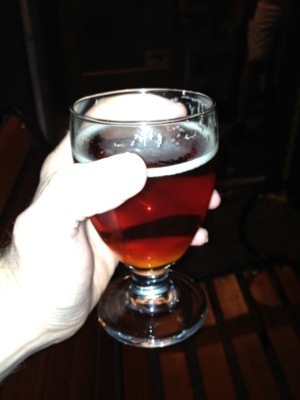 I did get a run down of the hop, grain and yeast bill of Green Man’s ESB, but not amounts. I am touring them again tomorrow, so maybe I can get more specifics. Well after a pint of Green Man’s Session fest Scottish Stout, I headed for the next event. On the way I stopped and got a tofu Spring wrap from on of Asheville’s Many food trucks. It was amazing. 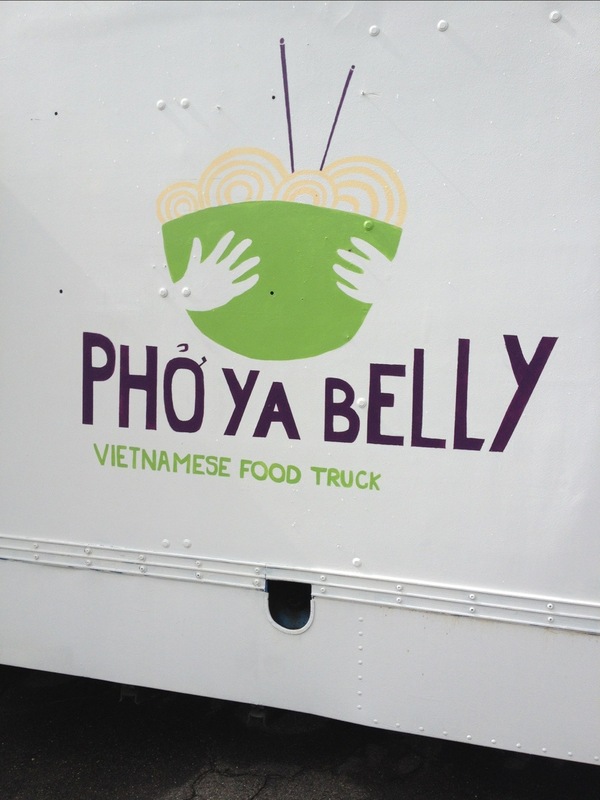 If you see this truck on the streets of Asheville, get food from them, you won’t be disappointed. 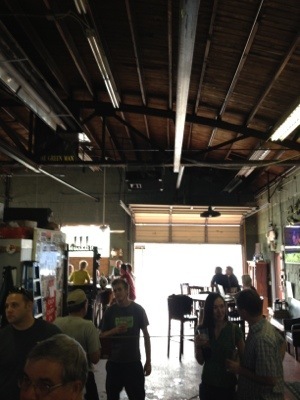 The next Beer Week event I went to was the Mystery Brewing release party at Bruisin’ Ales. Eric Lars Myers is a writer a former homebrewer and the current head brewer, owner and CEO of Mystery Brewing Company of Hillsborough, NC. He brought along copies of his book, North Carolina Craft Beer and Breweries. 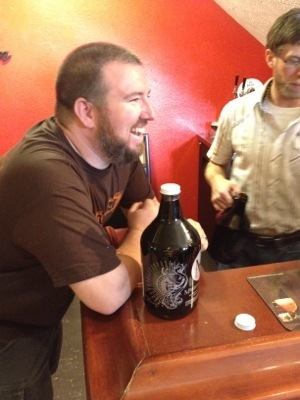 He also brought along for of his brews to sample. I spoke with him about brewing, got him to sign a copy of his book for me and had a great time at Bruisin’ Ales. I hung out for awhile before heading to the next event. 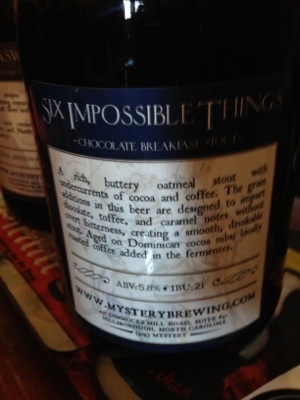 One of Mystery Brewing’s selections. 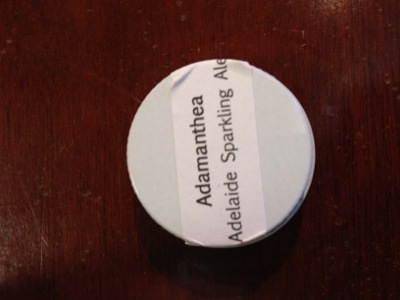 The 1st Mystery Brewing beer I sampled. Very light and refreshing. Eric brews good beer. 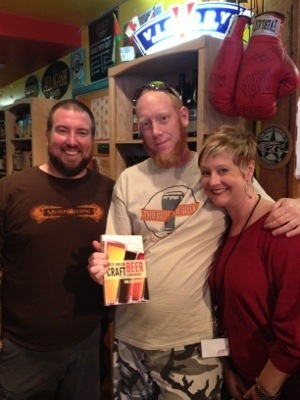 Eric of Mystery Brewing, Myself and Julie from Bruisin’ Ales. Probably my favorite picture taken of me at Asheville Beer Week so far. Well, I went off to the next event. Barley’s was having what they called “Sexual Lychee Night” which consisted of them tapping a keg or New Belgium’s Tart Lychee and Foothills Brewing Company’s Sexual Chocolate. I already have had Tart Lychee several times, seeing how we have it on tap at Suttree’s. I have only had Sexual Chocolate once, from a bottle. I had never had it before on Draft. 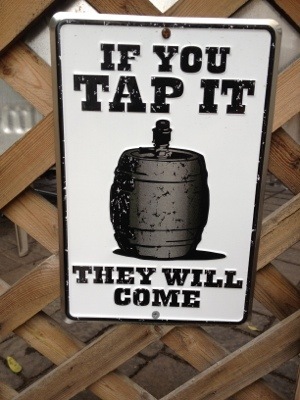 I got there and spoke with the bar tender and he advised me that they were waiting on the brewery reps to get there before they tapped the keg. I had another beer while I waited. By that time a twitter/ untappd friend of mine, Jeff Haws arrived in town. He met me at Barley’s. I was able to get a pour of the ultra rare Foothills beer and replenished my tank with a slice of Pizza, before heading back to Thirsty Monk. 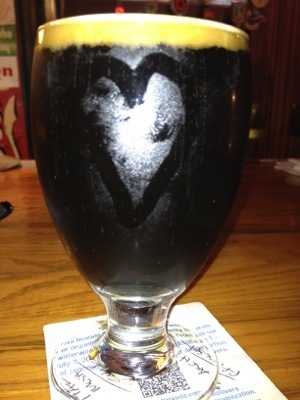 Foothills Brewing Company’s ultra rare and highly sought after beer, Sexual Chocolate. I had to stop back and drop off my book and a few things at the hotel first. When I got to the Thirsty Monk, they were at capacity and couldn’t let anyone else in. Downtown Asheville was packed and I could see from all the untappd check ins that many people arrived into town for Asheville Beer Week & Beer City Festival. They did allow me on the front porch and I sent Jeff in to get me a beer. I was eventually able to go in, but at that point I already had a comfy bench seat out front where I spent the rest of the night slowly sipping my beers. Jeff eventually headed back to his hotel. 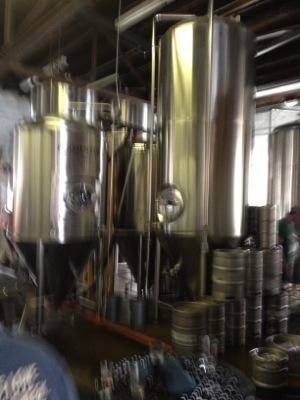 As I set that, I met the brewer for Mother Earth Brewing company while he waited for them to let more people in. We talked for a minute and then Aaron from Brewer’s Summitt arrived to hang out and drop off some promotional material. We headed downstairs, where I ran into Greg from Nantahala Brewing Company. 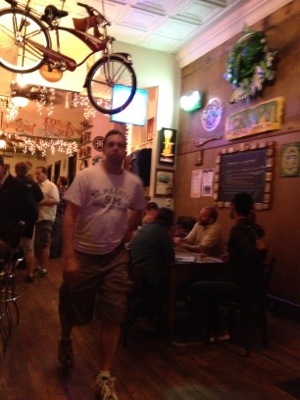 It seems like every brewer in town for today’s Beer City Fest made their way to the Monk at some point yesterday. It was getting late so Aaron gave me a ride back to the hotel. I have a ton of Brewer’s Summit posters and other promotional material I need to distribute, so if anyone would be willing to give me a hand, it would be very much appreciated. @JeffHaws at The Thirsty Monk. Super Rare Sierra Nevada Beer that was brewed for Brian Grossman’s wedding. “Love at First Bike”. This entry was posted on Saturday, June 2nd, 2012 at 04:35 and is filed under #AvlBeer, #knoxbeer, #NCbeer, Asheville, Asheville Beer Week, Beer, Beer Books, Beer City Festival, Beer Festival, Beer Recipe, beer travel, Craft Beer, Drinking, home brew, home brewing, Knoxville bars, Knoxville beer blog, Ratchet, Thirsty monk, Uncategorized. You can follow any responses to this entry through the RSS 2.0 feed. You can leave a response, or trackback from your own site. One Response to Day 4 of my #beercation to #AvlBeerWeek @BeerCityFest !